Several frontline Ministers of the Yahapalanaya Government and Parliamentarians has once again utilized the Duty Free Permits granted to them to enrich their personal coffers, which has resulted in the country losing millions of rupees in revenue. Ministers Malik Samarawickrama, Lakshman Kirella and D. M. Swaminathan, along with Parliamentarians M. S. Thowfeek and Nalaka Prasad Kolonne have imported luxury vehicles using their duty free permits during the month of October. Meanwhile, Rights Activist Nagananda Kodituwakku has said that the country has been defrauded at least 7 billion rupees in tax revenue due to the abuse of the tax-free car permits given to the MPs. 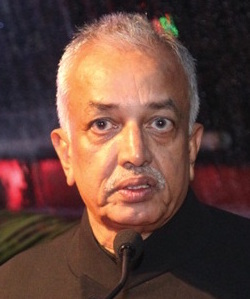 In a letter to President Maithripala Sirisena, Kodituwakku has also once again challenged the credibility and integrity of the former Director General of the CIABOC, Dilruksh Wickramasinghe and has once again accused her of abusing office of the Director General of CIABOC to confer benefits and favours to MPs. The activist said that from the citizens viewpoint, this is a very important case about the betrayal of their sovereign rights by all three organs of the government that exercise people’s sovereign rights purely on the trust placed in them (Article 4 of the Constitution), misuse or overstep of which tantamount to the breakdown of the rule of law and blatant disregard of the norm of representative democracy. The activist also draws the attention of the President Sirisena to observe that the absence of accountability process in the exercise of people’s sovereign rights by the organs of the government has already come under scrutiny by the United Nations Human Rights Council, compelling the Government of Sri Lanka to concede that the people have no trust and confidence in the administration of justice system, persuading it to co-sponsor the Resolution (A/HRC/RES/30/1) passed on 01st Oct 2015 in Geneva, Switzerland. 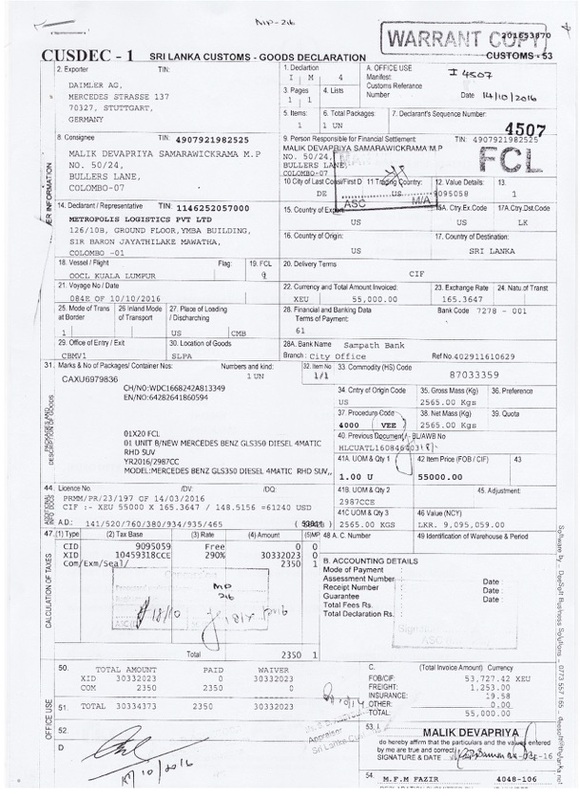 Providing the information inside out about this scam involving the MPs and Cabinet of Ministers, (including an up to date schedule of vehicles imported tax-free) the activist urges the President Sirisena to discharge the office as per his Constitutional Oath and in terms of Article 33 (1)(c) of the Constitution, ensuring proper functioning of the CIABOC, by appointing an independent person with high degree of integrity to the office of the Director General of the CIABOC with clear mandate given to initiate Criminal proceedings in terms of Section 70 of the Bribery Act against all individuals holding office as MPs and the Cabinet of Ministers, including the former Director General of CIABOC Dilrukshi Dias Wickramasinghe for abusing the office held for public good but misused the office to confer benefits or favours for themselves or others causing tremendous revenue loss to the government. Kodituwakku also urges the President to initiate legal action against all dishonest MPs and Cabinet of Ministers to recover the entirety of the statutory levies defrauded concerning the sale of tax-free car permits to those who are not entitled to use this privilege. Native Vedda: “State functionaries are not domestic servants of politicians but the guardians of state coffers…..” Where are you living? Is it Dambana or abroad in Youkone Province in Canada?. The type of state functionaries you speak of lived during immemorial times. They are no more. Did you not hear of the ex Sectretary to the ex President, Mr Lalith Weeratunga who spent Rs. 600 millions to spend on “Sil Redi” (Devotees Clothes) to be distributed to voters during the last Presidential Election; or he “cleared” a “Bullet Proof” luxury vehicle worth Rs. 80 million from the Port and that which was not registered but used by a one time LTTE stalwart. You know how another high level “Civil Servant” Mr. P.B.Jayasundara who was convicted and debarred from holding any “Public Office” was appointed the Secretary to the Treasure. Then what about Ms. Jayaratne, the Deputy Secretary to the Ministry of Defense who bolted from the country when charged in Avant Garde case. There are so many such persons who are answerable to corruption functioning in Ministries under this Government. They HAVE to and ACT in such manner as Domestic Servants, if they are to survive and give a life to their families. You say, they must be Guardians of Government coffers and are supposed to work in the interest of the Public. These days are you living in Angoda? Yukon (not Youkone) is not a province but a territory in Canada. Politicians say that they need a 4 wheel drive expensive luxury vehicles to reach destinations where normal vehicle cannot go. It is the politicians who are responsible for having such destinations in our country. The best is to stop all these expensive car imports and limit to import of cars and cabs only upto 1600 cc for petrol and 2300 cc for diesel. We can allow the HE President, Prime Minister, Chief Justice and the Service commanders to import vehicles above that category to suit their requirement. MPs and government officials could only import vehicles with duty concessions only a maximum of two vehicles in their life time. After all are the poor citizens should bear the cost of luxury vehicles import for wealthy politicians. If they argue that the car permit is sold for them to contest the next parliament, then what about the new comers who are to contest same. Fully agreed, in the context of our pathetic finances, this should be implemented IMMEDIATELY, specially in the context of increased taxes so speedily implemented last night. Reporting and whistle blowing is presenting the today situation ..so why hark on the past to justify the present ….just let us reflect on the minds of our politicians. stuck in the groove of power and priviledge behind the facade of being the the Law maker .Why have their minds not evolved into to the present attitudes of the world over or worked on the principles of Buddhism and Christianity where thanha or acquisitiveness is not what we hear ..,We all agree that these VIPs need vehicles for to carry out their immense duties .Why have the pundits not drawn up a scheme where the official cars are state owned and co-ordinated to make them available to this person for his term in office May be a sustainable scheme that would not tax the state coffers Why do our leaders give us .A sound education to wipe out the attitude of the people who think they need 4wd for urban use..educate the mind of our future leaders the practicality of using vehicles that do not guzzle the precious oil.. …Leaders and educators have to educate the kids of the future how to be achieve happiness without undue thanha of social status based on exterior values like a racing car or a 4WD . .Why do I hear a sense of awe for those who acquired a car permit by circumventing the law in this whole episode reported in the press about car permits .. Vehicle permits for foreign exchange earning workers in the middle east was suspended by the previous government with ulterior motives. They deserve to be granted car permits for that huge revenue, not the politicians who are burning that revenue. When will we ever get rid of these scoundrels? How long have we got to tolerate these parasites? else where it says, the total revenue from VAT is Rs 170 million. Importing Tax Free cars need Rs 110 million and Ranil’s car alone is Rs 30 million and Ranil needs two cars. Probably, One is a decoy. we vote these guys,these guys buy vehicles duty free. we pay duty? we have to put up with there nonsense. bond scam/ killings/corruption. we have to have stiffer penalties for elected officials, say hanging/ cut there hands if proven of theft. confisticate property. also family should be charged. tribal laws .and tatoo must be put on there head HORA. Trevor, you are correct. First preference of importing duty free cars should be given to the people who are working in other countries and who are bringing lot of foreign exchange. It is their hard earned money which is used to import cars for MPs and government executives. Well said Trev.Why are the politicians so special? We need a change of culture in the country. The politicians are there to make money, enjoy unjust privileges while the taxpayers have to put up with them and there should be an end to this horrible gravy train. Upul: Thank you for correcting me. As an investor and a true patriot would like to commend likes of Prof Wejesooeiya and even the likes of JVP for standing up against unbearable corruption in the country. History is now repeating itself and we must all together stop the rot or we will be another failed state. Situation now similar to period prior to 1815 where our leaders like Ehalapola,Kappatipola,Pilamathalawa had to appeal to the British to save the country from decay where then our own kings and their cronies did what they want, couldn’t care less for the innocent people who were virtually slaves of the hierarchy. Our past leaders must have experienced and even appreciated the orderly lifestyles of the colonial types. It seems a few of them have even ventured out to places like Batavia under Dutch rule and seen the high standards the colonials have inculcated on these countries and they want the same in Sl,but as usual some took the wrong end of the stick of colonial culture,just as our brats are doing in night club,just as our last king indulged themselves at the Maligawa drinking imported Drambuie Whisky and abusing people for pleasure. One must read the book written on Kandy by Late doctor Nihal.Karunaratne. But sadly those who want to change the new culture got the British dispose they king and replace him with the very people to the convention where business as usual would be maintained. They stated their agitation to gain power with the rebellions in 1818 and 1848 where the people were on the side of the new rulers, who gave them better standards where the first school ever to be built was in Kotte in 1822,the Christian college where Damapala and other eminent leaders had their education. All our leaders did was to confiscate the assets given to the people’s benefit and even change the names. 1845 was a crucial moment in our history where the scoundrels were well controlled and the people had true democracy, just as in UK.After seeing and enjoying the civility, good governance we enjoy in Uk,where most want to settle, we want that be duplicated in SL..If our kings could drink Drambuie and the last regime could drink Blue Whiskey and beat one another why not we absorb the best of their culture that everyone wants to come and live? Hope we had with RW seems to be diminishing with the Bond scam but can we be a bit generous and accommodating and allow him to bring the country from the deep hole, even if we have to get a bit of the colonial types to help us out?We have to make some brave and firm decisions to put the country right without bringing in chaos that will be well exploited by the scoundrels of the past that will use their money to buy vote etc.So be warned. Sorry for the slight error where I meant 1848 not 1845,where some took advantage to topple the stable life given to us by the colonials and grab power for themselves. We glorify scoundrels and thugs like Puran Appu(one Fernando from Costal area)who was captured and executed and lived happily ever after till 1948.Glorification of history is dangerous as it could be manipulated by rogues. History of any nation is not glorious but stained with blood of innocent. I see recent monuments for convicted criminals who escaped justice.Tajmahal and the pyramids are true examples of the dark ages of our history that is glorified. I say look forward and move on.